Preheat oven to 350°F / 175°C. Line a baking tray with parchment paper. In a small bowl, mix together the espresso, maple syrup and dark brown sugar until combined and the sugar is mostly dissolved. Lay out the bacon evenly across the pan. Using a brush, brush on half of the maple and coffee glaze on the bacon. Only brush the maple and coffee glaze on one side of the bacon at this time. Bake in the oven for 10 minutes. Remove the pan from the oven and turn the heat up to 400°F / 205°C. Carefully, flip each slice of bacon over. Brush on the remaining maple and coffee glaze. Put the pan back in the oven and bake for another 10-15 minutes. Allow to cool slightly before removing the bacon from the pan. If you don't have an espresso maker, you can also use this cold brew coffee concentrate. 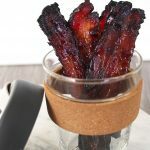 Get this recipe for Maple and Coffee Glazed Bacon (GF) at https://www.theworktop.com/breakfast-brunch-recipes/savory/maple-coffee-glazed-bacon/.